As a young child I was surrounded by kids who drew well. My friends filled the margins of their notebooks with clever doodles. I tried my hand as well, but for the most part my images foreshadowed an early career in music, not art. That didn’t dampen my appreciation for good drawings, however. From time to time this interest has led me to the specialized branch of drawing known as anatomical illustration. The challenge for anatomical illustrators is to create images of the human body that not only look good but “read” well, that give us information about human anatomy and physiology. Leonardo da Vinci was one of the greats, as was the Belgian artist Andreas Vesalius, whose genius and careful eye revolutionized the teaching of anatomy. The challenge for anatomical illustrators is to create images of the human body that not only look good but “read” well, that give us information about human anatomy and physiology. In this article I hope to inspire you to make a few very simple anatomical drawings of your own. The illustrations will contain information about a subject dear to most yoga students’ hearts: diaphragmatic breathing. If you have artistic talent, so much the better, but Leonardian skills are definitely not required. Everyone can master these drawings. And as you do, you will gain a solid understanding of the functioning of the diaphragm. So find a pencil and a few sheets of blank paper, and roll up your sleeves. Like most yoga students, you probably know a thing or two about the diaphragm. You understand that it is a muscle and that it is responsible for bringing air into the lungs. You may even have a vague idea about the location of the diaphragm. But ask yourself to make a drawing, a task that requires committing your ideas to paper, and you will probably respond, well—cautiously. Without reading beyond this paragraph, put the magazine down and try your hand. 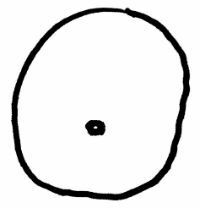 Draw the diaphragm as you picture it in your mind’s eye. Your drawing doesn’t need to be perfect, but it will start your graphics-wheels turning. Now, take a look at four samples of the diaphragm drawn by experienced yoga students (apologies to those of you who may see resemblances to your own work here). These four reluctant illustrators had previously been exposed to images of the diaphragm, but had never been asked to make a drawing of their own. As you can see from their efforts, drawing the diaphragm can produce widely varying results, but each of these illustrations emphasizes an important anatomical or physiological feature. 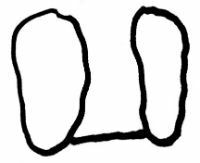 The first is based on the observation that diaphragmatic breathing causes the front of the abdomen to expand (the small dot in the middle is the navel); the second is intended to illustrate the shape of the diaphragm and show that it divides the torso in two; the third places the diaphragm at the bottom of the lungs; and the fourth shows it descending during inhalation. Each illustration tells us something about the diaphragm, but each also leaves us looking for the upgraded version. In drawing the diaphragm, one of the problems is that it is three-dimensional, and most of us are accustomed to seeing two-dimensional illustrations. To complete the image in three dimensions, we are left to our own devices. 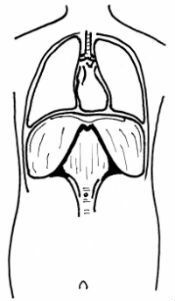 This version shows the diaphragm as a line—a thin slice of muscle, with neither front nor back. 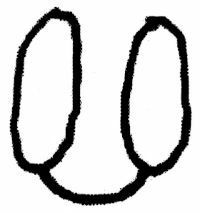 It is the result of drawing the diaphragm in a frontal plane (a plane paralleling the front of the body) and removing everything but the merest outline of tissue. This is a minimalist’s view, to be sure, but it does contain a good deal of information. To begin, it shows the shape of the diaphragm—it rises at the sides of the body and extends from one side to the other, forming a dome in the process. 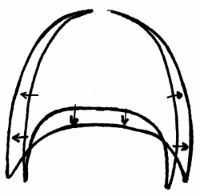 In the body, the right side of the dome is slightly higher than the left, to accommodate the liver that lies just below it; the stomach and spleen lie to the left. The top of the dome, a surface called the central tendon, is made of fibrous tissue (not muscle). The lungs and heart rest primarily on this surface. The areas of vertically aligned muscle tissue along the sides of the diaphragm, the areas of apposition, are apposed (placed side by side) to the rib cage and have an important role to play in the mechanics of breathing. But many mysteries still remain. Where does the diaphragm lie in the rib cage? How are the lungs and heart arranged in relationship to it? Where are the organs of the abdomen? Just how does the diaphragm move in relation to all these structures? Most important, what does the diaphragm really look like? We can answer some questions without abandoning our two-dimensional view. First, let’s show the location of the diaphragm. To do this, we need to consider how the diaphragm moves: its dome descends within the rib cage during inhalation and ascends with exhalation. Use your own body as a reference. Place your fingertips at the center of your chest, slightly above the base of the sternum (the breastbone). Next slide your fingers directly to the right, just beneath the breast. 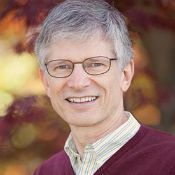 Find the rib there; it is the sixth rib. During inhalation, the dome of the diaphragm descends to the space just below this rib. 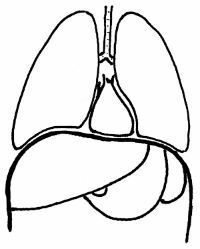 During exhalation the diaphragm relaxes and rises to the level of the space just above the fifth rib. The sides of the diaphragm, the areas of apposition, extend to the bottommost rib and contain the relatively long muscle fibers that merge into the central tendon on top. When these fibers contract, the dome of the diaphragm is pulled down. 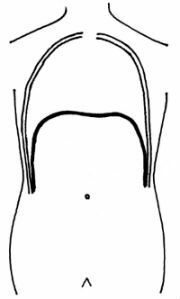 To illustrate the proper placement of the diaphragm in a drawing, you will need to show the full torso, the rib cage, and the diaphragm (top and sides). To begin, make an outline of the body from the shoulders to the hips. About two-thirds of the way down, draw a small circle to mark the navel (this is about the level of the twelfth rib). 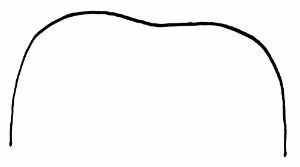 Next, draw a smooth outline of the rib cage. And finally, draw the diaphragm with its dome slightly higher than midway in the rib cage (then sit back and admire your work). It would be helpful now if we could show the relationship between the internal organs and the diaphragm. The lungs and heart share the space above the diaphragm, while the organs of the abdomen lie below. The heart is surrounded by connective tissue called the pericardium, which is woven into the dome of the diaphragm. Beneath the diaphragm, the liver extends well across the upper abdomen, from right to left. The stomach curves to the left, partially concealed by the liver. Even farther to the left is the spleen. The drawing gives us all this information. Notice the way in which the lungs hug the upper surface of the diaphragm. The left lung has only two lobes, not three (like the right lung), leaving more room for the heart. The trachea travels down between the lungs, entering them from the inner sides. Make the drawing yourself a few times. When the diaphragm contracts it pushes on the abdomen from above. But there is no empty space in the abdomen except for small amounts of gas in the bowel. So, much like the downward pressure of a plate on a ball of dough, when the abdomen is compressed from above its contents are pressed outward in all directions. The rib cage expands laterally in erect postures because when the diaphragm contracts, it meets resistance from the abdominal organs below. They act as a broad fulcrum, tipping the lower ribs out and flattening the surface of the diaphragm. This movement can be illustrated by superimposing two images—one for exhalation and one for inhalation. Drawing the diaphragm in three dimensions creates a much more impressive image, because it supplies its front and back, parts that were missing from our previous drawings. But before putting pencil to paper, let’s see if we can generate a mental image of the picture we want to draw. The front of the diaphragm follows the shape of the rib cage and looks like an open pup tent. Place both hands at the base of the sternum and trace the edge of the ribs as they slope down and out to the sides. 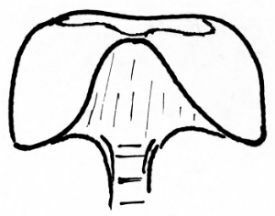 This A-framed opening of bone and cartilage outlines the front edge of the diaphragm. The upper abdomen (the space in the middle of the “A”) is covered by layers of muscle, but these are abdominal muscles; they are not part of the diaphragm. You can imagine yourself under the diaphragm looking up at it, or above it looking down. If you like to draw, there is no end to the detail and perspective you can give your drawings. With a little help from an anatomy text, you can make a side view, a diagonal view, or a back view. You can imagine yourself under the diaphragm looking up at it, or above it looking down. You can draw the individual ribs of the rib cage, and then add the diaphragm. You can show the nerves that enervate the diaphragm. In other words, you can build a collection of images that add to your understanding of the mechanics of diaphragmatic breathing. In the process you will come to really understand it. And if you are a yoga teacher, don’t be afraid to go public with your drawings. They will add a new dimension to your classes. For your final project, you might put some of the pieces together from the drawings you have already made. Draw a bare-bones outline of the torso just as before. Then place a three-dimensional image of the diaphragm into the torso and add the lungs, heart, and trachea. This will clearly illustrate many of the important characteristics of the diaphragm and give you a good drawing for your refrigerator door. Next stop: the National Gallery.